The first point may be slightly obvious, but nonetheless, it’s a very important one. Traditionally, the color green has been associated with Ireland for as long as any of us can remember. Because of this, it makes perfect sense to incorporate as much green as you can into your email design. This is one occasion where you can really afford to go over the top – the Irish love to dress up and show off their heritage. Do the same in your design and it’ll be an instant hit. We love this fabulous green design from American Eagle Outfitters. While on any other day of the year it’s be a complete headache to look at, it fits perfectly for the fun vibe of St. Patrick’s Day! Thumbs up for the beer glasses too! Trivia: A common misconception is that the four-leaved clover is the symbol for Ireland. This is false! Although strongly associated with luck and good fortune, the four-leaved clover is not the true symbol of Ireland. If you want to keep to tradition, use the shamrock ☘ – this is the symbol of St. Patrick and has been synonymous with Ireland for centuries. Ever heard the phrase “the luck of the Irish”? It exists for a reason! If you’re interested, take a look at this fascinating little story. Good fortune and St. Patrick’s Day go hand in hand, as luck has always been associated with the Irish. Take advantage of this and take the opportunity to start a competition or a giveaway. This is a great way to get your customers involved and hopefully boost exposure for your business too! If you don’t fancy starting a competition, you can still find ways to incorporate a theme of luck and good fortune into your email design. 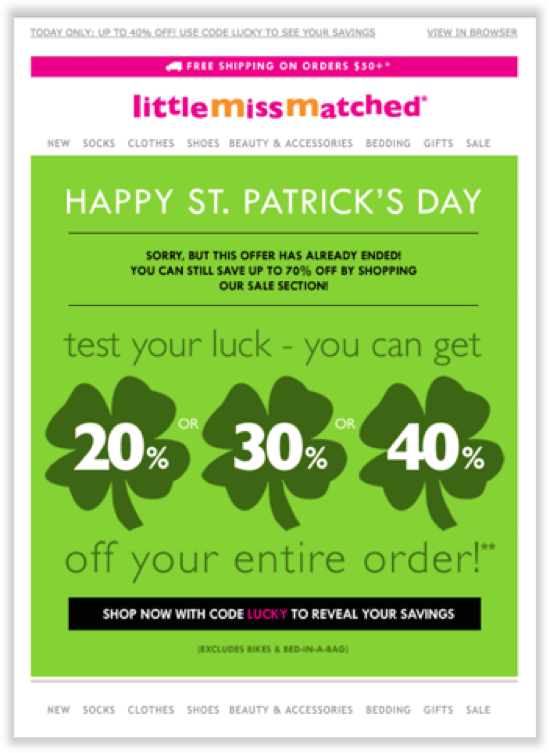 Little Miss Matched really got into the spirit of St Patrick’s Day with this email campaign by sending out discount codes of varying values. The lucky four-leaved clover motif rounded the design off perfectly! We’d probably be lying if we said that drinking wasn’t the first thing that came to mind when we think about St. Patrick’s Day! Renowned for their love of Guinness, whisky, and just a good time in general, the Irish particularly love to have a tipple on this special day. This is a great angle for your email marketing campaigns. If you run a bar, restaurant, or pub, St. Patrick’s night is the perfect opportunity to throw a party – regardless of if you’re Irish or not, people love to celebrate. Start sending out your invites soon if you haven’t already! However, even if your business has nothing to do with drinking, you can still use the theme to your advantage. 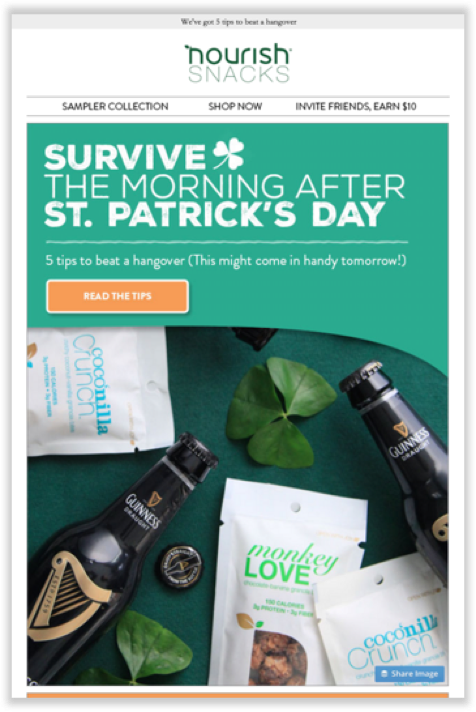 Nourish Snacks were super clever in marketing their healthy snack range as a tasty hangover cure, and offering tips to cure the bad head is also a very nice (and perhaps necessary) touch for their subscribers! Use lots of green in your designs and don’t be afraid to go overboard. Make the most of the typical emojis to draw attention to your email. Don’t confuse 🍀 with ☘! Remember the fun stereotypes of the day and make sure to incorporate them into your campaign. We wish you a very Happy St. Patrick’s Day!